Since it's July 4 weekend, I figured I'd go with a semi-patriotic Foreign Object Friday. 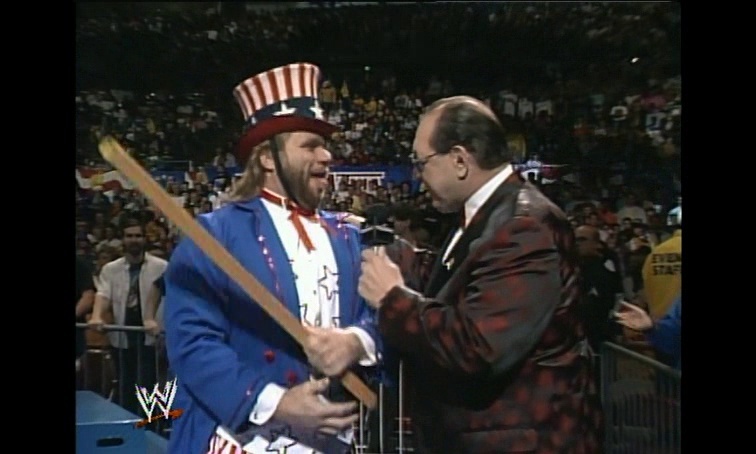 It's hard to argue there are many wrestlers more patriotic than Hacksaw Jim Duggan. For decades he has carried the American flag in one hand and his 2x4 in the other. Throw in a "Hoooo!" and a thumbs up and it's like it's 1988 all over. From time to time Hacksaw would turn to his trusty 2x4 for some assistance in the ring. The most memorable time for this in my 1-2-3 cents was on a Saturday Night's Main Event in early 1988. Andre the Giant was choking Hulk Hogan in the center of the ring. Several good guys rushed to help the Hulkster but no one could break the Giant's massive grip. That's when Hacksaw hit the ring and whacked the broad back of Andre with the 2x4. The hits worked and the Giant finally released the champion. Eventually, the two would end up feuding and the board was used again throughout their battles. Hacksaw pulled out the 2x4 against other famous foes, including Dino Bravo, Bad News Brown and the Iron Sheik. Hacksaw's first appearance at WrestleMania III including him hitting the former champion with the 2x4. There were times the board would be decorated. 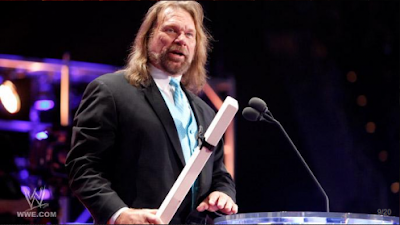 Yellow ribbons adorned it during the Persian Gulf War and when Hacksaw was inducted into the WWE Hall of Fame in 2011, the 2x4 was present and wearing a black bowtie. Foam versions were sold with Hacksaw's likeness at live events in the 80s. To this day, when he makes an appearance, Hacksaw signs small pieces of wood for fans in attendance. Hacksaw is another Superstar that I've had the chance to meet in person. In 2011, shortly after his induction, I got to interview him at Rent One Park in Marion, Illinois. It was a great opportunity. Every time I'm near a 2x4 I pick it up, prop it on my shoulder and shout out Hoooooo!